UMHS students please take note of the recent announcement by the NBME of the launch of NBME U, an online collection of lessons to aid your learning the range of topics in the basic sciences in preparation for the NBME shelf exams and USMLE Step 1 assessment. Visit the NBME U learning portal to enroll https://nbmeu.desire2learn.com. 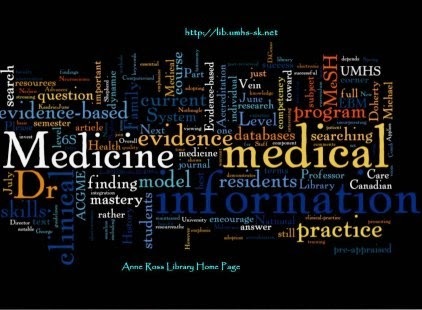 Please check out too the great hard copy USMLE review and practice question resources on Reserve at the Anne Ross Library Desk. The Cochrane Collaboration has relaunched their new and improved blog called Evidently Cochrane! After blogging about over 200 Cochrane reviews during the last eighteen months, the blog has proven very popular gaining a wide and growing audience. I think you will agree that the engaging and colorful format draws you in, in a manner similar to Pintrest! But what are Cochrane reviews? "Cochrane Reviews are systematic reviews of primary research in human health care and health policy, and are internationally recognized as the highest standard in evidence-based health care. They investigate the effects of interventions for prevention, treatment and rehabilitation. They also assess the accuracy of a diagnostic test for a given condition in a specific patient group and setting. They are published online in The Cochrane Library." Here are UMHS in St. Kitts we have access to The Cochrane Library through the Pan American Health Organization (PAHO) and the Cochrane Virtual Health Library (VHL). Learn more about Evidently Cochrane: Sharing Health Evidence You Can Trust by clicking on the embedded link and enjoy the blog! Learn more about Cochrane and systematic reviews by trying out these learning modules which illustrate real life dementia research examples.